Tuesday, May 10 at 6:30 pm. Dr. Mark Windham, Distinguished Professor in Ornamental Pathology at UT Knoxville, will speak to our society about Rose Rosette and where we are with the research being done. Dr. Windham is a very knowledgeable and entertaining speaker. In fact, those of us who have heard him are sure he could be a stand up comedian. Come enjoy a fun evening talking about a serious subject in the world of roses. Our meetings are open to the pubic, so invite those you think might be interested. Saturday, June 11 is our Rosefest 2016. This is going to be a day filled to the brim with roses. More on that here. If you need tickets ($10), contact us via email at indplsrosesoc@gmail.com. Saturday, July 9 at 6 pm is our Wine and Roses Party in the beautiful garden of Mark & Cathy Nolen. Details here. Share this article in email or on your social media networks! For event details and registration information, read on here. GUESTS: These meetings are open to the public so come and join the rosey fun. Everyone who wants a soil test, bring a cup of soil in a non-metal container. Pitch-in: Bring your favorite wine and a hearty appetizer. 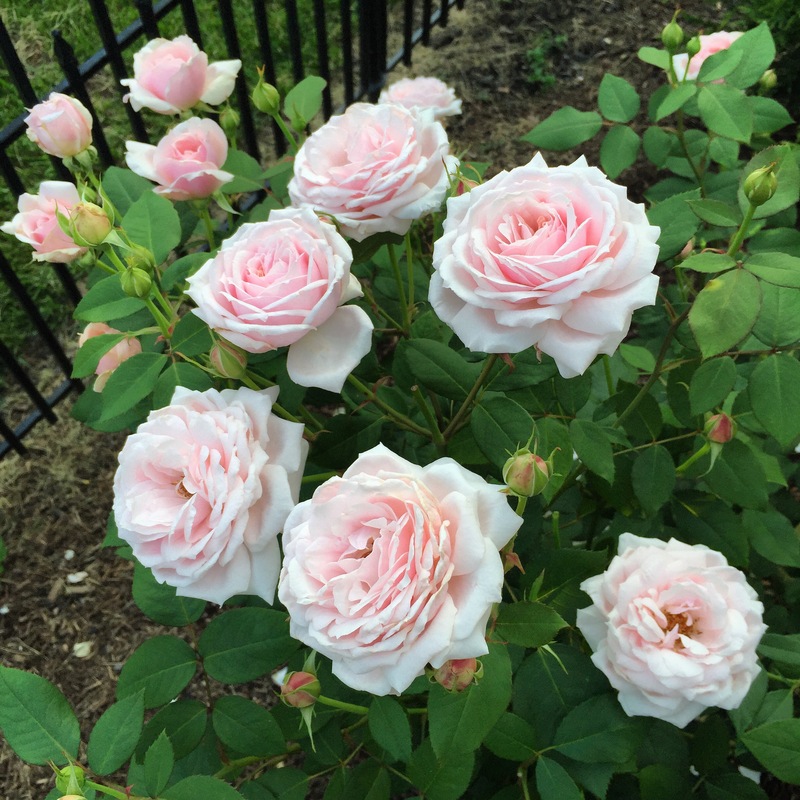 Indianapolis Rose Society invites you to a day filled with roses! Sponsored by the Hamilton Country Master Gardener Association. Public is invited to judge the rose displays. $10 ticket – entrance to all three lectures! Limited seating for lectures. (Tickets will go fast… let us know if you want them, here or contact Monica @ IndyMonica@gmail.com. Rose display winners announced at 4 pm. Peggy is the VP of the Heritage Rose Foundation and owner of the original Peggy Martin Rose, the rose that survived Hurricane Katrina. 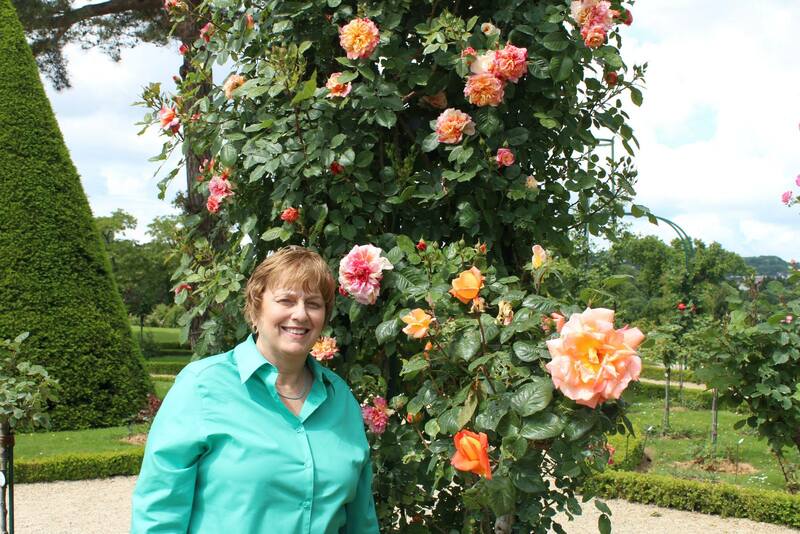 Carol is the former President of the Indianapolis Rose Society, a well respected rosarian and grower of more than 500 roses. Gaye is a noted expert of the Texas A & M Earth-Kind Program and lectures nationwide about growing roses in no spray conditions. Roses and rose products will be available for purchase. Roses and rose arrangements from member’s garden will be on display. The public is invited to judge displays. There will be educational resources on roses and rose culture. The Indianapolis Rose Society board of directors welcomes you to new year in roses. It promises to be a full, busy and satisfying year. We challenge you to bring a friend to every meeting! WE HAVE A FANTASTIC YEAR LINED UP! Humberto DeLuca, Program Chair (2nd Vice President), has been working hard, along with the input from all of the board, to outline a great year in programs and events. Most programs will have two mini-programs and a round table discussion. John Hefner is taking the lead on many round table discussions. Expect an outstanding program about Rose Rosette from Dr. Mark Windham, University of Tennessee. Mark could do standup comedy; he is that funny. He is also that educational! You will learn about the newest research on how to combat and prevent the dreaded Rose Rosette disease. Dr. Windham is an absolute treat. I have heard him speak several times and I never tire of him. Teresa Byington and Monica Taylor have poured their hearts and souls into the First Annual Rosefest. It will be held at Hamilton County Fairgrounds, Noblesville, in June. There will be a tea, rose show display and educational programs eligible for CR and MG credits. Bring roses for display. Bring yourself to learn from the great lineup of speakers, including the knowledgeable Peggy Martin (Vice President of the Heritage Rose Society), our own Carol Tumbas (past President of the Indianapolis Rose Society) and the charming and dynamic Gaye Hammond (Earth Kind Rose Trials in Texas). This is one fantastic line up! Call it the “dream team” of rose programs. Do not miss out on this exciting new venture. Donna Hefner has assumed the responsibilities of Treasurer. We know our money is in good hands with Donna! We appreciate her stepping up to take over this very important role. Renee LaFollette has once again, accepted the role as editor. The editor keeps us connected through the newsletter. We thank Renee for her long term commitment. We have a sundry of committee chairs, serving in a lot of different and important capacities. We thank them for taking on these important roles. In addition to the annual fertilizer program, Mark Nolen is serving as membership chair (new position). He has contacted every single member of the Indianapolis Rose Society, cleaning up our roster and has already recruited a new member. The personal touch helps! Cathy and Mark will be hosting a wine and roses garden tour at their home. 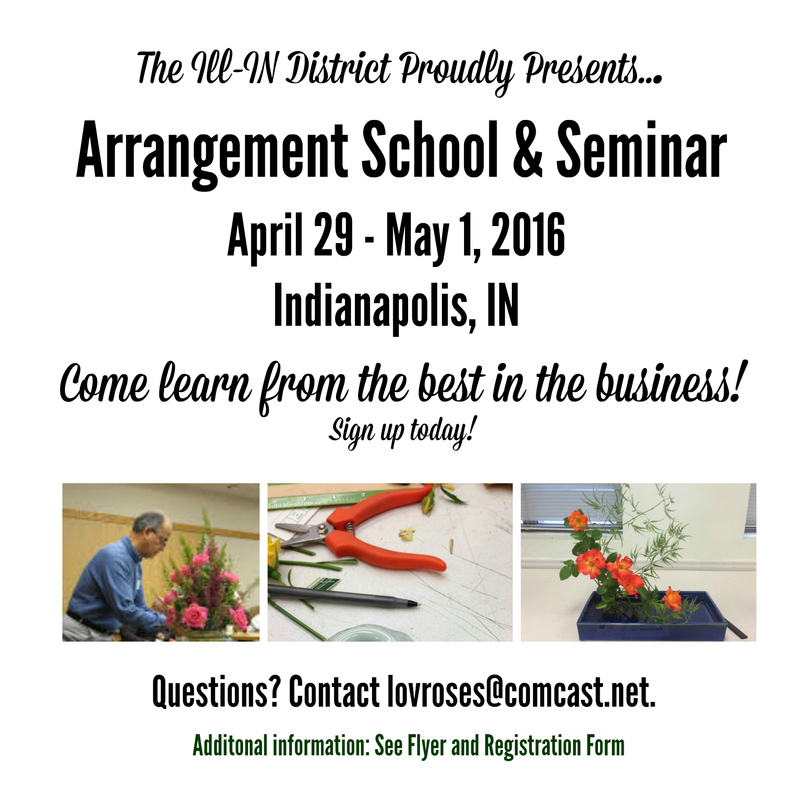 Another big event for 2016 is the Arrangement Judging School & Seminar. It has been over a decade since Indianapolis has hosted such a school. If you have any desire to attend, whether just to learn or to become a judge, please let me know. We would love to fill the room! Diane and Roger Brueckman (Roger is the IL-IN District Director), will be visiting in the fall. The Brueckmans’ are a lovey couple. You will enjoy their program, personalities and updates on the District/ARS business. Let us share the year 2016…. share the joy, share the love, share the friendships and share your roses. We are going to have fun and it will be more fun if you are there. It is that time! Time to kick off the 2016 rose year! Our officers have been working hard to put together a lineup of programs that will be perfect for the newbie and those who have been growing roses for years. We are even having a ROSE FESTIVAL and a WINE AND ROSES GARDEN TOUR! But, more on that in upcoming blog posts. This is a perfect time to come check us out and hear what we have planned! For more information, contact Linda here. We wish you a very Happy Valentine’s Day filled with love and roses. We also want to invite you to join us for the first meeting of the 2016 rose year! We have so many exciting events coming up that we are excited to share with you. Can you keep a secret??? One of our events is a Wine and Roses Party in a most beautiful rose garden of one of our members. Can you guess who? It is no secret that we hope you will join us. It won’t be the same without YOU!